Just because you need extra space, ground clearance, and practicality, does not mean you have to settle for a boring ride. Now is your opportunity to find yourself in a BMW X6! BMW engineers were the first to design an SUV to truly have the sleek body and driving dynamics of your favorite coupes and sports sedans. Based on the same platform as the ever-popular X5 SUV, the X6 gives you a similar, but more attractive, rarer, and sportier package. 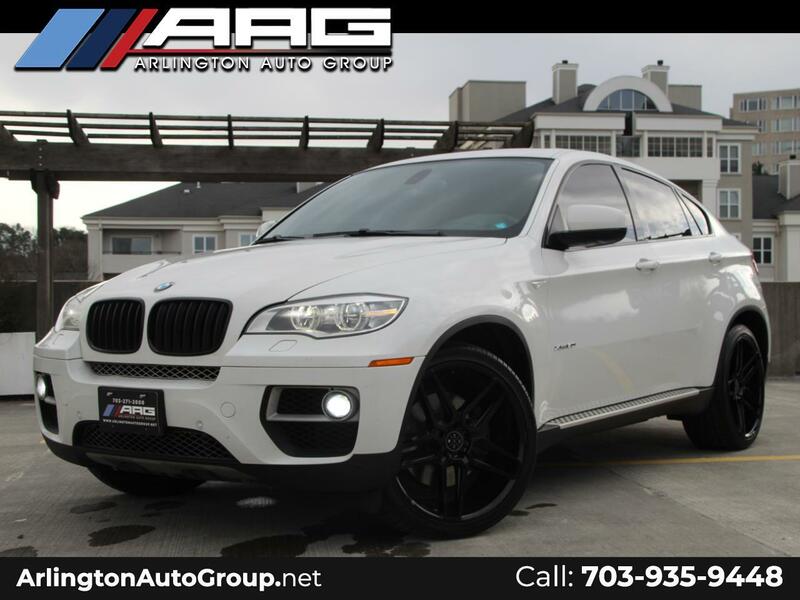 This particular example is an XDrive50i model, so it comes equipped with all wheel drive and a whopping 400 horsepower and 450 lb-ft of torque from a twin-turbocharged 4.4 liter V8. The sporty attributes of this vehicle are greatly aided by the appearance of this Alpine white-dressed monster. There’s no mistaking this for anything else on the road as you come across the black kidney grilles, sloping rooflines, LED lighting package, crystal-White HID fog lights, brushed aluminum running boards, and the XDrive50i-specific trapezoidal exhaust outlets. Further making this particular X6 unique is a set of gloss black finished Blaque Diamond 22-inch wheels wrapped in 265mm front tires and 315mm rear tires. The sportiness continues on the inside, as the seats are upholstered in a velvety red leather color option and the dash and door panels are garnished with brush aluminum trim for a modern look. The interior presents itself in a very technological and inspiring fashion, with the iDrive infotainment screen being the center of attention. It’s hard to miss the intelligent shift knob and iDrive control knobs that emerge from the center console. Another standout design element is the placement of the speaker grilles throughout the door panels and the A-pillars. Despite being designed for an aggressive SUV experience, this is still a luxurious cabin to be in with features like power lumbar support, power side bolster cushions, iDrive infotainment, rear passenger window shades, dual-zone climate control, heated seats, LED lighting, premium sound, satellite radio, navigation, folding rear seats, rain-sensing windshield wipers, soft-close doors, push to start, keyless entry, seat adjustment memory, Bluetooth connectivity, a USB input, power folding mirrors, and more. Behind the wheel of an X6 is a blast of a place to be! Forget about the sports coupes and sedans that you’ve always dreamt about — this is it still! Somehow, the handling is extremely car-like and you still have space to place adults in the rear and their luggage in the trunk, when necessary. The tightness of the steering wheel is satisfying through high speed turns and provides plenty of feedback and confidence for drivers of all types. The body remains flat and ready for the next turn to defeat, or the next straightaway to blast through. Give the throttle a bit of a push, and then you’ll hear the rush of induction snarl and exhaust grumble that this V8 is very good at. The power is available from anywhere in the rev range with technology such as twin turbochargers, direct injection, and variable valve timing. Some drivers still may wish to tailor the experience for themselves, so that’s when the available drive “Sport” mode and steering wheel mounted paddle shifters come in handy. The instantaneous response of the paddles is paired with a highly renowned ZF-sourced 8-speed automatic transmission. Given the fact that this vehicle was previously leased through BMW Financial Services and having this color combination of the X6, we cannot expect it to be on our lot very long. Please come in and see this vehicle while you still have the opportunity! The 100 photos we’ve provided do not lie one bit about the quality of the vehicle you are getting. It surely looks and drives beautifully. Come hear and feel this vehicle in action! Before even posting it online, we’ve taken the time to have this vehicle COMPLETELY serviced from head to toe. The maintenance on this car is without a doubt up to date, and ready to be driven to a home today. If long term ownership is a possibility, please feel free to ask about our extended warranty options. WE LIKE TO THANK OUR MILITARY CLIENTS BY OFFERING THEM ADDITIONAL INCENTIVES!!! If you have any questions about this vehicle, or if you are ready to reserve it for yourself, please call or text us at (571) 260-3207! Message: Thought you might be interested in this 2013 BMW X6.